For other uses, see Geraldton (disambiguation). 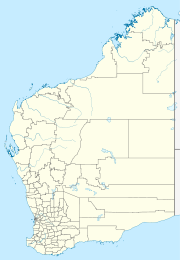 Geraldton is a coastal city in the Mid West region of Western Australia, 424 kilometres (263 mi) north of Perth. At June 2018, Geraldton had an urban population of 37,648. Geraldton is the seat of government for the City of Greater Geraldton, which also incorporates the town of Mullewa, Walkaway and large rural areas previously forming the shires of Greenough and Mullewa. The Port of Geraldton is a major west coast seaport. Geraldton is an important service and logistics centre for regional mining, fishing, wheat, sheep and tourism industries. Clear evidence has established indigenous people living on the west coast of Australia for at least 40,000 years, though at present it is unclear when the first indigenous people may have originally explored and lived in and around Geraldton. The original local Aboriginal people of Geraldton are the Naaguja people with the Nanda immediately to the north and Badimia immediately to the east. Today the Aboriginal people of the region generally identify as "Yamatji" or "Wajarri" people. Wajarri country is inland from Geraldton and extends as far south and west as Mullewa, north to Gascoyne Junction and east to Meekatharra. The Aboriginal people of the Murchison-Gascoyne region were instrumental in assisting early settlers in the area in identifying permanent water sources, and worked in the pearling, pastoral and fishing industries. Yamatji art is a distinctive style of painting, using thousands of dots of ochre and other earth-based pigments to create patterns and images relevant to Yamatji/Wajarri culture. The Western Australia Museum at the marina in Geraldton hosts a permanent exhibit on Yamatji/Wajarri culture and history of the region. Many European mariners encountered, or were wrecked on, the Houtman Abrolhos islands 60 kilometres (37 mi) west of Geraldton during the 17th and 18th centuries. Although two mutineers from the Batavia were marooned on the mainland in 1629 there is no surviving evidence that they made landfall at or near the site of the current town. The wreck of the Batavia, flagship of the Dutch East India Company (VOC) fleet on her maiden voyage, on Morning Reef of the Houtman Abrolhos on 4 June 1629, and the events surrounding the subsequent mutiny, rescue and punishment of her crew are of great historical significance to the region. A detailed account of the events is recorded in a 24 December 1897 Western Mail article "The Abrolhos Tragedy", translated from the notes of Francois Pelsaert, the commander of the Batavia when she ran aground. The Western Australian Museum in Geraldton houses an exhibition of clay pipes, silver coins, cannons, the original Batavia stone portico and numerous other relics recovered from the wreck of the Batavia and other notable local historical shipwrecks such as the Zuytdorp, Zeewijk and Vergulde Draeck. The explorer George Grey, while on his second disastrous expedition along the Western Australian coast, passed over the future site of Geraldton on 7 April 1839. George Fletcher Moore, on the colonial schooner Champion, explored the region in January 1840 and discovered Champion Bay. He was followed by Lieutenant John Lort Stokes of HMS Beagle, who led an expedition to the area in April 1840, and named and surveyed Champion Bay. A decade later, explorer Augustus Gregory travelled through the area. A member of his party, James Perry Walcott, discovered lead ore in 1848 in the bed of the Murchison River. The Geraldine mine was subsequently established, named after the County Clare family home of Charles FitzGerald, the 4th Governor of Western Australia. The town of Geraldton, named after Governor FitzGerald, was surveyed in 1850 and land sales began in 1851. During World War II Geraldton was the location of No. 4 Service Flying Training School RAAF. This flying school was formed on 10 February 1941 and disbanded in May 1945. Geraldton has a Mediterranean climate with semi-arid influence. Geraldton is very sunny, receiving around 164 clear days annually. In the winter the temperature is mild with daily highs averaging around 20 °C (68 °F). Most of the yearly rainfall falls in this period. In the summer months, Geraldton averages 32–33 °C (90–91 °F), with some days over 40 °C (104 °F). Daily afternoon sea breezes cool coastal areas and summer temperatures in coastal suburbs of Geraldton (Seacrest, Tarcoola, Geraldton CBD, Beresford, Sunset Beach, Bluff Point and Drummond Cove) are generally cooler than in inland suburbs, such as Strathalbyn, Utakarra, Woorree, Deepdale and Moonyoonooka. In June 2018 the population of Geraldton was 37,648, a decline from the recent peak of 38,792 in 2014. Aboriginal and Torres Strait Islander people made up 9.6% of the population. 76.4% of people were born in Australia. The most common other countries of birth were England 4.1%, New Zealand 1.9%, South Africa 1.4%, Philippines 1.3% and India 0.6%. 83.8% of people only spoke English at home. Other languages spoken at home included Malay 0.8%, Afrikaans 0.8%, Tagalog 0.6%, Italian 0.6% and Filipino 0.4%. The most common responses for religion were Christian 62.2% (Catholic 26.5%, Anglican 16.5%) and No Religion 30.0%. The economic output generated within Greater Geraldton, the 12,626-square-kilometre (4,875 sq mi) local government area incorporating Geraldton, is estimated at $2.944 billion. Greater Geraldton represents 56.26% of the $5.233 billion in output generated in Mid West Region and 1.19% of the $247.705 billion in output generated in Western Australia. The Port of Geraldton is a major west coast port with seven bulk handling berths and an average loading rate of seven tonnes per hour, ranking nationally (in tonnage for 2012/2013) 12th in exports (14,812,513); 23rd in imports (632,330); and 13th overall (15,444,843). The major exports from the Geraldton port in 2012/2013 were (tonnage): iron ore (10,741,662); grain (2,618,507); mineral sands (849,933); copper concentrate (149,450); zinc concentrate (148,420); nickel concentrate (65,919); and livestock (2,758). Major imports were petroleum products (328,021). In 2012/2013 the Geraldton port serviced 328 bulk haulage vessels. The Geraldton Visitor Centre is located at 246 Marine Terrace, formerly the original Railway Station. The historic building is an icon in Geraldton's West End and was originally built in 1878. It was the first railway station constructed on a Government line in Western Australia. Now more than 140 years on, the building’s heritage has been preserved through careful restoration and many elements from the original building feature in the Visitor Centre. The Point Moore Lighthouse, located south of the Geraldton Port is a cultural and historical attraction. It is the oldest surviving Commonwealth lighthouse in Western Australia and was also the first steel tower to be constructed on the mainland of Australia. The Point Moore lighthouse stands 35m tall and its 1000w Tungsten Halogen Lamp can be seen for 23 nautical miles. It began operation in 1878. In 2007, the Geraldton foreshore area, previously an abandoned railway marshalling yard, was redeveloped and today hosts a playground with water activities, public green spaces, public beaches, picnic areas, basketball court and shaded play areas. The project was completed in 2008. Geraldton is a regular port of call for cruise ships with visits occurring approximately ten times per year. Volunteers, organised by the City of Greater Geraldton, greet visitors on arrival to provide information on activities and other assistance. In May 2009, the memorial was recognised by the Australian government as being of national significance. [Note, this vessel is the second Australian warship to be named HMAS Sydney, and is sometimes referred to as HMAS Sydney (II).] There are a number of memorials around the world dedicated to the many husbands, sons and daughters lost at war. Two noteworthy memorials from the first World War are the Menin Gate (1927) in Ypres and Thiepval memorial. The Mount Scott location has great significance to the HMAS Cruiser because The Waiting Woman sculpture's alignment and exact co-ordinates are positioned and pointed directly within a fraction of a degree of the location of the disappearance of the wreck. Geraldton has a Mediterranean climate with dry, sunny conditions and warm sea temperatures throughout the summer. Mean sea temperatures in the summer months (measured at 10m) are consistently above 22C, often exceeding 24C. Surface sea temperatures in summer regularly exceed 26C. The Geraldton foreshore area has pathways for walking, running, cycling, dog-walking, skateboarding and in-line skating. There are skate parks at Cape Burney, Maitland Park, Wonthella, Strathalbyn, Tarcoola Beach, Forrester and Drummond Cove. Farmers markets occur on Saturday from 8 am to 12 noon in Maitland Park on Cathedral Avenue and on Sunday at the Old railway station on the corner of Chapman Road and Forrest Street. 4WD access is permitted on many beaches around Geraldton. Access points are usually labelled with information and cautions. Road rules apply and beaches are patrolled by local rangers. Non-compliance to road rules or entry into prohibited areas attracts significant penalties. Many beaches are impassable at times around high tide and during periods of ocean surges. At certain times of year, access may become impossible due to beach erosion. During the spring, summer and early autumn months from September through April, Geraldton experiences consistent seabreezes. Windsurfing and kitesurfing locations include Back Beach, Separation Point ("Seppos"), Point Moore, Hell's Gate, St. George and Sunset Beach. The region is a popular windsurfing location, attracting significant numbers of overseas visitors and product testing by manufacturers. In 2005, Geraldton was host to the Australian KiteSurfing Association (AKSA) Australian National Championships. Surfing, and more recently Stand-Up Paddlesurfing, are also popular activities in and around Geraldton. Popular surf spots include Flat Rocks, Headbutts, Greenough, Back Beach, Sunset Beach and Glenfield. Stand-Up Paddlesurfing spots include Point Moore, Town Beach, The Foreshore, St. Georges Beach and Drummond Cove to the north. In winter, local weather conditions shift to predominantly easterly (offshore) winds. Indian Ocean storms generate large swells that produce good conditions for surfing (though the fringe barrier reef protecting the Geraldton coastline blocks much of the swell, significantly reducing the size of the waves that reach the beaches). Large swells may create potentially dangerous rip currents as water flows through passages between the reef. Saltwater fishing, boating and sailing are popular along Geraldton's coastline. Local and visiting recreational fishermen and women target a wide variety of native sport fish from the beaches and wharves that includes Mulloway, Bream, Tailor, Whiting, Sharks and Cod; larger fish such as Dhufish, Mackerel, Tuna, Snapper, Sampsonfish, Coral Trout and larger sharks, amongst many others are found on Geraldton's offshore reefs, located from approximately 8 km to more than 80 km offshore. A recreational fishing licence is not required when fishing from the shore but a licence must be obtained from the Department of Fisheries to fish from a boat. Significant fines apply for non-compliance. Recreational fishing for local Western Rock Lobster is also permitted during the season from December–April (exact dates vary from year to year) however, a special licence is required. Size and daily bag limits apply to certain species of fish and to all lobster catches. The city is home to the Geraldton Yacht Club, which marked its 100th anniversary in 2014. Scuba diving and snorkelling are popular activities around Geraldton. There are several wreck diving sites off the coast, including the South Tomi, which was sunk in 2004. The South Tomi is a 58.7 metre long, 9.81 metre wide vessel that was built by Niigata Engineering and Shipping Co Ltd. in Niigata City, Japan. In March 2001, the Republic of Togo registered South Tomi. The same month, the ship was identified fishing illegally in Australian sub-Antarctic waters and pursued by Australian Fisheries officers for 14 days, covering 3,300 nautical miles (approximately 6,100 kilometres). The vessel was boarded by Australian defence forces 320 nautical miles (approximately 600 km) south of Cape Town in South Africa and inspected. The vessel was found to be carrying an illegal catch of protected Patagonian toothfish and the vessel and its catch were confiscated by Australian authorities. The vessel was escorted 8,500 km to Western Australia and arrived on 5 May in Fremantle. The catch was sold by the Australian government for $1.4 million. The City of Geraldton secured the vessel to be sunk as an artificial reef. The ship was towed from Fremantle to Geraldton and scuttled on 18 September 2004 2.9 nautical miles off the Geraldton coast. The site is registered with the WA Department of Fisheries as a wreck and is closed year round to fishing within the defined boundaries – commencing at 28°43.968'S 114°33.392'E, then east to 114°33.206'E, then north to 28°43.752'S, then east to 114°33.392'E, then south to the commencement point. Water depth at the site is approximately 24.5 metres and the deck is 13 metres from the surface. The wreck of the South Tomi is one of WA's Top 10 Dive Wrecks and provides an easily accessible diving alternative to the nearby Houtman Abrolhos. Geraldton has a number of resident sporting teams, including Australian Rules Football, Basketball, Netball, Soccer and Roller Derby League. Geraldton is home to the Mid West Academy of Sport, a non-profit community organisation providing support to sporting talent (athletes, coaches, officials and administrators) throughout the Mid West Region of Western Australia. Geraldton is home to a horse racing industry and since 1887 has hosted the annual Geraldton Gold Cup meeting. The Geraldton Sunshine Festival, established in 1958, is one of Australia's longest-running festivals. The festival takes place annually in October, celebrating the arrival of Spring and providing opportunities for residents and visitors to engage with local businesses and other organisations. The Goodness Sustainability and Innovation Festival is held each August in and around Geraldton and showcases and celebrates innovation and achievement towards sustainability in the Mid West. The Big Sky Readers and Writers Festival - The festival has been hosted by the City Of Geraldton and run by The Geraldton Library staff. Australian and International authors come together to share their knowledge and experiences in many ways, from intimate dinners to large scale debates. The main beaches in Geraldton are Tarcoola Beach, Back Beach, Separation Point, Point Moore, Pages Beach, Town Beach, Champion Bay, St Georges, Sunset Beach and Bluff Point. The St Francis Xavier Cathedral was designed by World renowned Arts & Crafts architect and Catholic priest Monsignor John Hawes (1876 - 1956). Construction began in 1916 and was completed in 1938. The Cathedral's architecture is unique and considered one of the finest Cathedrals of the world built in the 20th Century. The Anglican cathedral of Geraldton was built during the 1960s. Queens Park Theatre is the largest entertainment and conference venue in Geraldton with a 673-seat auditorium (including box and circle seating), two large foyers with bars, a reception room, and a 500-seat outdoor amphitheatre. The theatre hosts professional events and performances from around the world. The Orana Cinemas in the historical West End is Geraldton's only cineplex with 3D available on selected movies. During the summer months a movie is sometimes shown at the side of Dome on Foreshore Drive by Sun City Cinema. The main pubs near the Geraldton CBD are the Freemason's Hotel on Marine Terrace, The Camel Bar (next to the Post Office), The Vibe and the Geraldton Beach Hotel. Geraldton Airport provides multiple daily flights to and from Perth, operated by QantasLink and Virgin Australia Regional Airlines. General aviation services include charter flights to the Abrolhos Islands, to WA minesites and to various tourist destinations. The main passenger terminal is equipped with a licensed café, a private lounge for hire and a free public Wi-Fi hotspot. Flight training schools, aircraft maintenance facilities and a local aero club are based here. Construction is underway (2014) on an Airport Technology Park. The Geraldton Batavia Coast Marina consists of three jetties, 47 commercial and recreation boat pens, 42 floating pens, boat ramps, toilets, carpark, fishing platform and a boardwalk. Geraldton Volunteer Marine Rescue (active on weekends and public holidays) monitor marine radio frequency 27.88 MHz and VHF Channel 16. Local groups also monitor other frequencies such as 27.90 MHz, 27.91 MHz and VHF channels 72 and 73, as well as their own channels. The Geraldton Regional Art Gallery opened in 1984 and was one of the first "A Class" regional galleries in Australia. The Aquarena is a public swimming facility managed by the City of Greater Geraldton. It has 50-metre and 25-metre pools, a leisure pool, a water slide and hydrotherapy facilities, with water polo and swimming squads and group fitness sessions. The Queen Elizabeth II Centre (QE2) is home to a variety of community and seniors' groups, and offers facilities for public hire, including two large halls with equipped kitchens. The QEII Centre is available for local and visiting seniors, group meetings and also provides an internet hub for seniors. Geraldton is host to one of the 121 "points of interconnection" for the Australian National Broadband Network (NBN), providing service to the largest geographic region in Australia. Geraldton was the first regional community in Western Australia where the NBN Fibre to the Premises (FttP) network was deployed in July 2013. NBNCo provides a fixed wireless broadband service for some parts of the region and in 2013/2014 introduced high speed optic fibre broadband services to areas of Geraldton in and near the city centre. All occupiable premises in Geraldton's urbanised areas between Tarcoola Beach in the south and Drummond Cove in the north are outfitted with nbn Fibre to the Premise services, with construction completed in mid 2017. (Excluding Mandurah) Geraldton is currently (2017) the only regional town in Western Australia with nbn Fibre to the Premise services. A number of Internet Service Providers offer services to Geraldton that include (where available) Fibre to the Premise (FttP) via NBNCo, private fibre networks (Seacrest Estate), as well as via public spectrum (5.8GHz Class License) wireless links. Upon completion of the nbn rollout, nearly all copper-based services (ADSL, Frame Relay, Standard Analogue Telephone lines, etc.) were decommissioned and are no longer available. In 2012, the City of Greater Geraldton was one of 33 cities worldwide selected to receive a Smarter Cities® Challenge grant from IBM. The stated aim of the project is to "identify smart digital services and opportunities that leverage the increasing availability of broadband and to develop smart energy strategies that will enable the community's vision of becoming a carbon-neutral region by 2029". The region is serviced by the major mobile phone companies with 3G networks provided by Telstra, Optus and Vodafone, and 4G and 4Gx (700 MHz) by Telstra. Geraldton has two hospitals: Geraldton Regional Hospital (public) and St John of God Hospital (private). Geraldton Regional Hospital is the only facility in Geraldton with a 24-hour Emergency Room. Geraldton Regional Hospital is a 55-bed hospital comprising accident and emergency, medical, surgical, paediatrics, maternity, intensive nursing, chemotherapy unit, day surgery and a renal dialysis unit. Allied health services (speech pathology, psychology, physiotherapy, occupational therapy, pharmacy and audiology) are also available at the hospital. St John of God Hospital is a 60-bed hospital with medical, surgical, acute care, maternity and palliative care. There is also an adjoining specialist centre where residential specialists are based. This included three general surgeons, radiologists, an orthopaedic surgeon, two obstetrician/gynaecologists, an ophthalmologist, GPs and anaesthetists. Visiting specialists consulting rooms are also based here. Geraldton has visiting specialists covering a wide range of medical specialities. Most visit Geraldton monthly. There are 42 private general practitioners resident in Geraldton, including four general practitioners employed by the Geraldton Regional Aboriginal Medical Service (GRAMS). Most of the GPs and resident specialists in Geraldton are involved in teaching Rural Clinical School medical students. Community services include the Aboriginal Medical Service, the Community Drug Service Team, the Community Health and Development Centre, and the Community Mental Health Team. Private diagnostic facilities include Geraldton Radiology at SJOGH, the PathCentre at GRH and SJOG Pathology at SJOGH. The Geraldton Universities Centre is an independent, not-for-profit, incorporated body, supporting university courses in Geraldton on behalf of a range of universities including CQUniversity, Charles Sturt University and the University of Southern Queensland. The centre is an Australian first with university places allocated specifically for Geraldton, allowing students to study locally while living and working in the Mid West. The majority of graduates now work in regional Western Australia. The student body has grown from 20 student places in 2001 to more than 200 enrolled students in 2015, undertaking a range of bridging and full degree programs. Central Regional TAFE (formerly, Durack Institute of Technology) is a college of TAFE providing education, training programs and services to the community including school leavers, mature age students, industry/corporate groups, international students, employers and those who study for their own personal and professional development. The Batavia Coast Maritime Institute (BCMI), a subsidiary of Central Regional TAFE, is a training, research and development facility located at Separation Point in Geraldton. BCMI offers coursework in Aquaculture, Aquaponics, Conservation & Land Management, Coxswain, Master Class V, Horticulture, Environmental Science, Marine Engine Driving Grade 1&2, Laboratory Sciences, Sustainability, Marine VHF Radio, Recreational Skippers Ticket and Restricted Coxswains. The Houtman Abrolhos islands are 60 kilometres (37 mi) west of Geraldton. The Murchison Radio-astronomy Observatory Support Facility in Geraldton, operated by CSIRO, provides support services for the Square Kilometre Array project located at the Murchison Radio-astronomy Observatory, 315 km northeast of Geraldton. The Australian Defence Satellite Communications Station (ADSCS) is located at Kojarena, 30 km east of Geraldton. Geraldton has a public bus service run by TransGeraldton and is connected to Perth with coach services provided by Transwa. QantasLink and Virgin Australia provide services from Geraldton Airport; the airport is also used for general aviation. ABC Midwest & Wheatbelt (6GN 828 AM) – Part of the ABC Local Radio Network. ABC Radio National – (6ABCRN 99.7 FM) – Speciality talk and music. ABC News Radio – (6PNN 101.3 FM) – Rolling News bulletins, news magazine programs and LIVE coverage from Federal Parliament House of Representatives. ABC Classic FM – (6ABCFM 94.9 FM) – Classical and Jazz Music. The Spirit Network (Radio 6BAY FM 98.1 \ 1512 AM) – Classic Hits / Adult Contemporary Music format aimed at 35 years + audience. The programming schedule is mainly the same as the Seven, Nine and Ten stations in Perth, with variations for news bulletins, sport telecasts such as the Australian Football League and National Rugby League, children's and lifestyle programs and advertorials. GWN7 produces a 30-minute regional news program each weeknight (originating from Bunbury) with a newsroom based in Geraldton, covering the local area. The Geraldton Guardian was established in 1878 as the Victorian Express and is the state's second oldest extant newspaper in continuous circulation (after The West Australian). It is published on Monday, Wednesday and Friday. Yamaji News, published since 1995 by the Yamaji Languages Aboriginal Corporation, is a fortnightly Geraldton newspaper presenting issues and stories affecting indigenous people in the Gascoyne and Murchison districts. The Midwest Times is published on Thursday and is issued free to residents and businesses in the Geraldton and the Mid West. "Everything Geraldton" is an online news and social media site with a focus on local news, events, community issues and community engagement. ^ a b c d "3218.0 – Regional Population Growth, Australia, 2017-18: Population Estimates by Significant Urban Area, 2008 to 2018". Australian Bureau of Statistics. Australian Bureau of Statistics. 27 March 2019. Retrieved 22 April 2019. Estimated resident population, 30 June 2018. ^ "2011 Census Community Profiles: Geraldton". ABS Census. Australian Bureau of Statistics. Retrieved 15 September 2016. ^ a b Australian Bureau of Statistics (27 June 2017). "Geraldton (Significant Urban Areas)". 2016 Census QuickStats. Retrieved 23 December 2017. ^ Cane, Scott (2013). First Footprints: The epic story of the first Australians. Allen & Unwin. ^ "Western Australian Museum — Geraldton". Western Australian Museum. Government of Western Australia. Retrieved 14 September 2015. ^ "Batavia Shipwreck Site and Survivor Camps Area 1629 – Houtman Abrolhos" (pdf). Department of the Environment. Canberra ACT: Commonwealth of Australia. 6 April 2006. Retrieved 22 March 2016. ^ "Batavia's History". Western Australian Museum. Western Australia Government. Retrieved 21 November 2016. ^ Grey, George (1841). Journals of two expeditions of discovery in North-West and Western Australia, during the years 1837, 38, and 39, describing many newly discovered, important, and fertile districts, with observations on the moral and physical condition of the aboriginal inhabitants, etc. etc. 2. London: T. and W. Boone. p. 26. Retrieved 17 March 2012. ^ "Expedition to the Northwest". The Perth Gazette and Western Australian Journal. 8 February 1840. p. 23. Retrieved 6 November 2014. ^ Kimberly, Warren Bert (1897). "13. Land Laws; Exploration; Australiand Settlement 1839-1842". History of West Australia. Melbourne: F. W. Niven & Co. Retrieved 22 April 2014. ^ Stokes, John Lort (1846). "Chapter 5: Victoria River to Swan River". Discoveries in Australia, with an account of the coasts and rivers explored and surveyed during the voyage of the Beagle, 1837–1843, Volume 2. London: T and W. Boone. Retrieved 6 November 2014. ^ Birman, Mary (1979). Gregory of Rainworth : a man in his time. Nedlands, WA: University of Western Australia Press. p. 32. ISBN 0855641657. ^ Gregory, A.C. (25 November 1848). "Geological Remarks". The Perth Gazette and Independent Journal of Politics and News. p. 2. Retrieved 18 November 2013. ^ Crowley, Francis Keble (1966). "FitzGerald, Charles (1791–1887)". Australian Dictionary of Biography,. Melbourne University Press. Retrieved 22 March 2016. ^ "Assist.-Surv.-Gregory's Report". The Perth Gazette and Independent Journal of Politics and News. 15 March 1850. p. 2. Retrieved 30 March 2016. ^ "Land Sales". The Perth Gazette and Independent Journal of Politics and News. 28 March 1851. p. 2. Retrieved 30 March 2016. ^ "Geraldton Airport Comparison - Site 008051 (1941–2014)". Climate statistics for Australian locations - Monthly climate statistics. Bureau of Meteorology. 6 March 2014. Retrieved 7 June 2015. ^ "Greater Geraldton Gross State Product, REMPLAN". City of Greater Geraldton. 2016. Retrieved 4 November 2018. ^ "The Moore Point Lighthouse at Geraldton". Lighthouses of Australia, Inc. Retrieved 17 November 2015. ^ "Meet and Greeters Recognised for Hard Work". City of Greater Geraldton. Archived from the original on 14 February 2014. Retrieved 26 February 2014. ^ Emily, H.(2016). The Waiting Women. Geraldton. Retrieved from: photo taken myself. ^ McCarthy, Michael (June 2002). "The HMAS Sydney/HSK Kormoran engagement: an analysis of events leading up the 60th anniversary celebrations in November 2001". Western Australian Maritime Museum. Retrieved 31 October 2010. ^ a b "HMAS Sydney II Declared a National Memorial" (pdf) (Press release). Minister for Veterans' Affairs. 21 May 2009. Retrieved 12 October 2011. ^ McDonald, Glenys (2005). Seeking the Sydney: a quest for truth. Crawley, WA: University of Western Australia Press. p. 205. ISBN 1-920694-54-4. OCLC 62557643. ^ Stephens, John Richard. "Commemorative Landscapes to the Missing: The HMAS Sydney II Memorial". Landscape Research. 39 (5): 523–541. doi:10.1080/01426397.2012.756862. ^ "Commemorative Landscapes to the Missing: The HMAS Sydney II Memorial". Landscape Research. 39: 523–541. doi:10.1080/01426397.2012.756862. ^ Emily,H.(2016). The Dome of Souls. Geraldton. retrieved from: Geraldton, Taken myself. ^ "Menin Gate". Brewers Dictionary of modern phrase and fable. Menin Gate. 2009. ^ "Symbolism | HMAS Sydney II Memorial Geraldton". 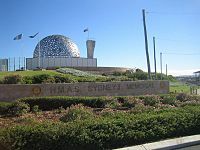 www.hmassydneymemorialgeraldton.com.au. Retrieved 16 May 2016. ^ "Coastal Ocean Temperatures off WA". CSIRO. Australian Commonwealth Government. ^ "Geraldton Port Authority Seaview Main Shipping Channel Entrance Sea Surface Temperature". Geraldton Port Authority. Archived from the original on 26 February 2014. Retrieved 21 February 2014. ^ "2005 AKSA National Championships, Geraldton". Australian KiteSurfing Association. Retrieved 25 May 2005. ^ "Western Rock Lobster". Western Australia Department of Fisheries. Archived from the original on 11 February 2014. Retrieved 11 February 2014. ^ "About the Geraldton Yacht Club". Geraldton Yacht Club. Archived from the original on 27 February 2014. Retrieved 27 February 2014. ^ "Another one that didn't get away!". Australian Government, Department of the Environment, Australian Antarctic Division. 2001. Archived from the original on 18 November 2015. Retrieved 17 November 2015. ^ "The Geraldton Sunshine Festival". Sunshine Festival Organisers. Retrieved 27 February 2014. ^ "Parks and Beach Facilities in Geraldton". City of Greater Geraldton. Archived from the original on 6 March 2014. Retrieved 25 February 2014. ^ "City Starts Delivery of Technology Park". City of Greater Geraldton. Archived from the original on 11 March 2014. Retrieved 11 March 2014. ^ "Geraldton Volunteer Marine Rescue". Geraldton Marine Rescue. Archived from the original on 25 January 2014. Retrieved 10 March 2014. ^ "Geraldton Art Gallery". Geraldton Regional Art Gallery. City of Greater Geraldton. Archived from the original on 11 March 2014. Retrieved 11 March 2014. ^ "Geraldton Aquarena". City of Greater Geraldton. Retrieved 25 February 2014. ^ "NBN points of interconnection" (PDF). Australian Competition and Consumer Commission. Retrieved 29 September 2016. ^ "NBN switched on in Geraldton". Australian Broadcasting Corporation. Retrieved 10 July 2013. ^ "NBN rollout map". National Broadband Network. NBN Co Limited. Retrieved 20 February 2014. ^ National Broadband Network. "nbn's 3-year rollout plan". nbn. Archived from the original on 29 October 2015. Retrieved 29 October 2015. ^ "Optus expands mobile coverage in Geraldton". SingTel Optus Pty Limited. 17 February 2010. Retrieved 17 April 2012. ^ Pappas, Liana (27 September 2011). "Telstra lights up 4G mobile services in Australia". Macworld Australia. Niche Media Pty Ltd. Archived from the original on 12 October 2013. Retrieved 17 April 2012. ^ "Geraldton, The Rural Clinical School of WA". University of Western Australia, Rural Clinical School of WA. Retrieved 21 February 2014. ^ "Gerladton Universities Centre". Retrieved 25 February 2014. ^ "Murchison Radio-astronomy Observatory Support Facility" (pdf). Australia Telescope National Facility. CSIRO. Retrieved 11 September 2015. ^ "Occasional Paragraphs by an Idle Man". The Herald. 26 June 1880. p. 3. Retrieved 14 March 2014. ^ Hartnup, Margaret (February 2003). "Access to Early WA Regional Newspapers: Pre-Federation to 1905" (pdf). J S Battye Library of Western Australian History. State Library of Western Australia. Retrieved 12 March 2014. ^ "The Geraldton Guardian with which is incorporated the "Geraldton Express"". Geraldton Guardian. 3 January 1948. p. 1. Retrieved 11 March 2014. ^ "Yamaji news". SLWA Online Catalogue. State Library of Western Australia. Retrieved 22 June 2012. ^ Kovacic, Leonarda; Lemon, Barbara (20 May 2005). "Pilkington, Doris (1937 - )". The Australian Women's Register. The National Foundation for Australian Women & The University of Melbourne. Retrieved 20 February 2014. Wikivoyage has a travel guide for Geraldton. Wikimedia Commons has media related to Geraldton, Western Australia.